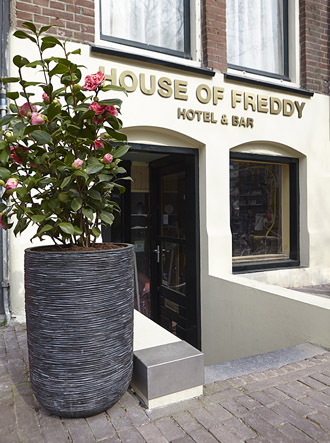 House of Freddy is situated on the wonderful Frederiksplein right in the centre of Amsterdam. The building in which the hotel is located consists of three floors and has been completely renovated in 2014. The basement has been refurbished into a pleasant bar which is open to both hotel guests and non-residents. The upper three floors each contain two hotel-rooms plus private bathrooms and toilets. The interior of House of Freddy is characterized by a boutique style ambiance. Each room has been decorated in a unique fashion and with a keen eye for detail in order to create a wholly individual, intimate/warm and luxurious style. Providing both this unique ambiance and the personal attention that complements it / goes with it, are matters that rank high with the proprietors of House of Freddy. So guests may use the hotel wifi network free of any additional costs or limitations. And you are welcome to make use of our speedy check in and check out service and do so at very flexible times. Moreover, rooms are cleaned on a daily basis and guests may contact either of the proprietors personally by day or by night. So staying at House of Freddy not only means spending a comfortable night’s sleep in a luxurious hotel room, but also enjoying a very pleasant, personal and service-oriented approach to hospitality.